Look out for very cheap cauliflowers this weekend. Supermarkets are awash with the vegetable as a result of bumper crops in the UK and other parts of Europe. 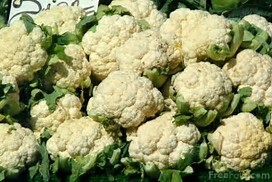 Cauliflowers can be picked-up for as little as 70p this weekend, as a consequence of farmers struggling to find buyers. Tesco, for example, has bought an extra 220,000 caulis, as producers in Kent are being forced to dump an astonishing £60,000 worth of the cauliflowers due to the large numbers harvested. The mild winter this year, has affected UK crops as unseasonal growing conditions have accelerated the growth of the cauli and so the crop has matured early. Farmers call these 'crop flushes. 'Some 40 acres grown near Broadstairs in Kent are set to go to waste, while some supermarkets are selling imported crops that have been shipped from Spain. So we should be helping our British growers this weekend and help reduce farm food waste. f you are shopping today or tomorrow, then buy a British grown cauliflower or two! The cauliflower is hugely versatile and the cooking options go beyond simply boiling it or making a cauliflower cheese, but I do love that! 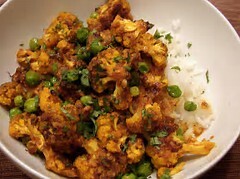 Look out while shopping, for retailers recipe cards on how to use cauliflowers. Think about using they veg dressed with curry and other spices to bring some new tastes and textures to your Sunday lunch. Support UK farmers this weekend and reduce food waste!